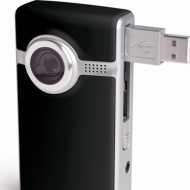 alaTest has collected and analyzed 8 reviews of Flip Video Flip Ultra. The average rating for this product is 3.9/5, compared to an average rating of 4.0/5 for other Camcorders for all reviews. Views about the image quality and design are on the whole positive. The portability and usability also get good feedback. Comments are divided on the size. There are some less positive comments about the price and reliability. We analyzed user and expert ratings, product age and more factors. Compared to other Camcorders the Flip Video Flip Ultra is awarded an overall alaScore™ of 81/100 = Very good quality. No SD/MMC card expansion slot; don't expect video quality to match that of a MiniDV camcorder's. The Muvee editing features only work with PCs, not Macs. With improved video quality, a slightly trimmer design, and upgraded software package, the Flip Video Ultra is becoming a force to be reckoned with in the emerging low-end digital camcorder category. The rechargeable batteries are a must, and having a couple of backup AA's would be prudent. Though many cameras do not have one, an input connection for an external microphone would be nice.